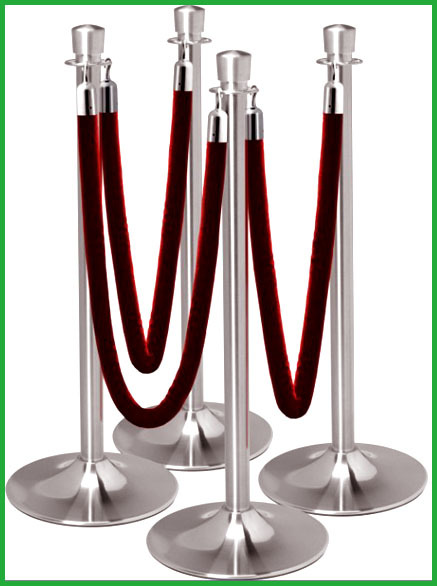 This is an instant four-post, three-rope queuing system that provides exceptional value! The traditional-style 39-inch high Tulip posts are of classic design at a budget-friendly price. Manufactured from solid steel tubing, they have a mirror chrome finish that resists dents and scratches. The lightweight base makes it ideal for applications which require frequent set up and tear down. The three light-weight foam core ropes are designed for use with this stanchion. They are 6 ft. in length and come with attached stainless steel hooks, which saves you even more. The choice of velvet colors are red, cambridge blue and black. This kit comes with everything necessary to set up an instant queue. Specifications: post height - 39"; post weight - 8 lbs. ; base diameter - 15"; rope length - 6'. Four-post, one-rope queuing system at a budget-friendly price. Traditional-style 39-inch tulip posts are manufactured from solid steel tubing and have a chrome finish. Choice of three belt colors.